God´s Existence. Can it be Proven? As the title suggests, this collection of twelve essays - by an international team of researchers - is the result of intersecting two areas of philosophical investigation which are often thought to be widely apart: Analytic Philosophy and the doctrine of St. Thomas Aquinas. The authors breathe new life into old ideas by examining Thomasic theses and arguments by applying the tools and techniques of Analytic Philosophy. 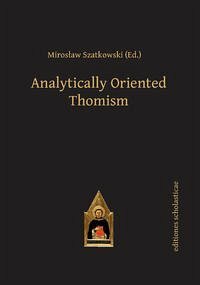 The volume begins with an introductory essay: "What Is Analytically Oriented Thomism?" The other essays divide into four broad categories: (1) The Thomistic Doctrine of God (essays 2-4); (2) Thomistic Metaphysics: Logical Reconstruction (essay 5); (3) Thomistic Metaphysics: Ontology and Epistemology (essays 6-9); (4) Philosophical Theology (essays 10-11). This book will be helpful to anyone interested in understanding and evaluating St. Thomas's ideas. Miroslaw Szatkowski is a professor of philosophy at the Warsaw University of Technology, Poland, and the Director of the International Center for Formal Ontology. He earned his PhD in philosophy from Jagiellonian University in Cracow, Poland, and was habilitated at the Ludwig-Maximilians University in Munich, Germany. Szatkowski's main fields of research are: logic, the foundations of mathematics, and formal ontology. In these areas, he has published papers in the following professional journals: Studia Logica, Zeitschrift für mathematische Logik und Grundlagen der Mathematik (Mathematical Logic Quarterly), Archiv für Mathematische Logik und Grundlagenforschung (Archive for Mathematical Logic), Notre Dame Journal of Formal Logic, Journal of Applied Non-Classical Logics, Journal of Logic, Language and Information, and Metaphysica; and in several collective volumes.